Stay Here and Play Here! Talk about convenience! 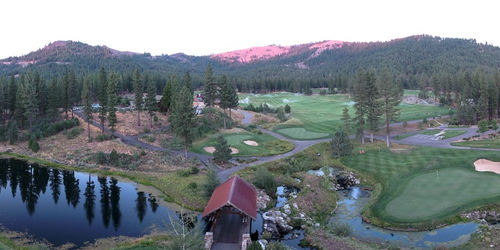 Grizzly Ranch's Wolf Tree Cabins are located a very short distance from the Golf Shop, so you can just walk here! The Cabins offer views of the 9th fairway and the many mountains from their windows and large decks. Here is the perfect place for guests to enjoy a serene place for relaxing and apres golf enjoyment. Two and three-bedroom cabins are available. Play the #1 Ranked Public-Accessible Golf Course in the Sierra Nevada, and stay only a short walk away from where you'll tee off! The Grizzly Ranch 2018 Stay & Play Package offers guests an opportunity to stay in 1 of our 3 Wolf Tree Cabins located only a few steps from the Golf Shop. Reserve the cabin of your choice and receive 10% off your stay (pre-tax) if you plan to play too. Grizzly Ranch reserves the right to change price and offer at anytime. Prices and offer are subject to change without notice. CaGolf.com is not responsible for errors posted in this golf package.